The automotive Holy Grail is a high performing vehicle with low cost fuelling. • Converter-and-mixer systems are the oldest style, dating back decades and still widely used. The liquid fuel is converted into vapour and then mixed with air before going into the intake manifold. • Vapour phase injection (VPI) systems use a converter-and-mixer system, but the gas exits the converter under pressure and is injected into the intake manifold. Electrically controlled injectors improve the metering of fuel to the engine, fuel economy and power, as well as reducing emissions. This has been the most popular type system in recent years. • Liquid phase injection (LPI) systems inject liquid directly into the intake manifold, where it vaporises, not using a converter. The fuel vaporising in the intake manifold cools and increases the density of the intake air, substantially increases power output, improves fuel economy and has lower emission, when compared to VPI systems. • Liquid phase direct injection (LPDI) are the most advanced systems, injecting liquid LPG directly into the combustion chamber. The LPG instantly vaporises, cooling the combustion chamber fuel-air mixture during the compression stroke, with further performance and emission improvements. Converting to Liquid LPG is a true Win-Win option. Liquid LPG systems are the latest generation in automotive LPG fuel system technology. You get a substantial fuel savings with LPG Autogas, combined with equal engine performance. Impeccable drive-ability and lower tailpipe emissions. How Do Liquid LPG Systems Work? The system pumps LPG at high pressure from the LPG tank to the engine inlet manifold via a set of liquid LPG injectors. The injectors spray the liquid LPG into the intake manifold. The LPG immediately vapourises after being injected. This vapourisation process rapidly cools the surrounding air. This cooling effect increases the density of the air-fuel mixture, ensuring power and torque are maintained and fewer CO2 emissions. The effect is similar to intercooling on turbocharged cars. An Electronic Control Unit (ECU) controls the various components of the liquid injection system, including the injectors. LPG injection signal optimises the flow and LPG injection timing. The ECU is calibrated to the specific vehicle and engine. This is unlike conventional LPG vapour conversion systems. Conventional systems put the LPG through a device called a vapouriser before introducing it into the intake manifold. This LPG vapour then goes into the intake manifold through either a mixer or an injector. The result is a less dense air-fuel mixture, which means lower engine efficiency and output. An old style vapour system can actually restrict vehicle performance, in comparison to liquid LPG injection. A vehicle with a state-of-the-art liquid LPG system produces at least the same amount of power when running on LPG, as compared with running on petrol. The dynamometer graph below shows the LPG versus petrol performance comparison of a Holden Commodore VE 6.0L. The liquid LPG version produced more power and torque than when running on petrol. Liquid LPG systems are so reliable that more than 1 million liquid LPG systems have been factory fitted by automobile manufacturers around the world. Both Ford and HSV have chosen liquid LPG for their factory equipped LPG Autogas vehicles. The manufacturers of these systems are so confident that they offer extended warranties on the liquid LPG systems. For example, Orbital offers a 3 year / 150,000 km warranty, depending on the model. One of the biggest advantages of LPG powered vehicles is the savings realised on fuel costs. Autogas is the safe, inexpensive way to run your car. Especially as the family budget seems to get more and more stretched! Converting to LPG will generally deliver a cost saving of between 50 to 65 cents per litre. This results in hundreds, if not thousands of dollars of savings every year depending on your vehicle usage. Running an engine on LPG may also reduce maintenance costs. LPG is a cleaner burning fuel than petrol, so engine life is not affected. Environmental savings are also part of the equation. Using Autogas creates appreciably less carbon dioxide (CO2) than unleaded petrol. CO2 is the primary greenhouse gas causing long term climate change. 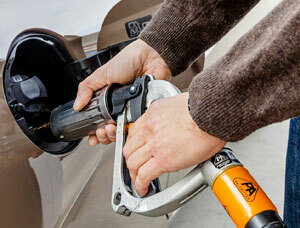 Overall tailpipe emissions can be up to 15% cleaner using LPG Autogas instead of petrol. There are over 100 engineered Liquid LPG Kits available for domestic and imported cars available from a number of Australian suppliers. There are also many specialist installers around the country who can install these kits on your car. Maybe it’s time for you to consider getting the “Automotive Holy Grail”? The information in this article is derived from various sources and is believed to be correct at the time of publication. However, the information may not be error free and may not be applicable in all circumstances.